Sleep Savior: A Local Mom Uses Research to Help Babies — and Parents — Rest Easy | Features | Kids VT - small people, big ideas! If you have an infant who's having trouble sleeping, you might have heard of Alexis Dubief. Her website, Precious Little Sleep, gets four million visits annually. On it, she writes about all things related to baby sleep — from white-noise machines to infant reflux to breaking the swing-to-sleep habit. All of her posts are rooted in current sleep and early childhood development research. 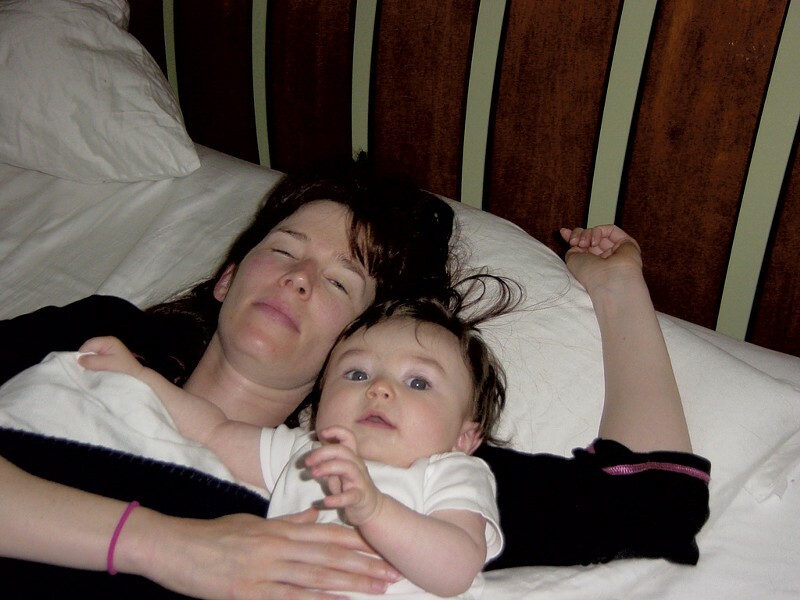 She's an internationally renowned sleep expert — a parenting rock star — and she does it all from her home in Essex, Vermont. 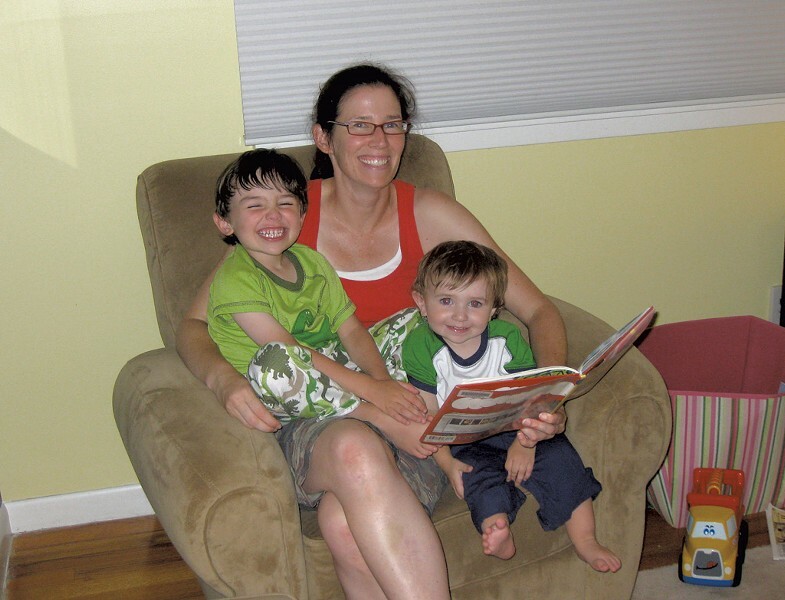 Dubief, her husband and their two children, now 8 and 10, share an unassuming brick and clapboard house on a well-kept suburban street. When her children were born, like many parents, Dubief struggled to understand their sleep issues. In 2011, she began blogging about her experiences as a way to build community, on a site she originally called Troublesome Tots. Dubief — who earned degrees in technical writing and finance and worked in the tech industry in Silicon Valley — quickly developed a loyal following of sleep-starved parents from around the world. In July, she released her first book, Precious Little Sleep: The Complete Baby Sleep Guide for Modern Parents. As of press time, out of more than 9,000 sleep disorder titles on Amazon, her book was the site's sixteenth top seller. 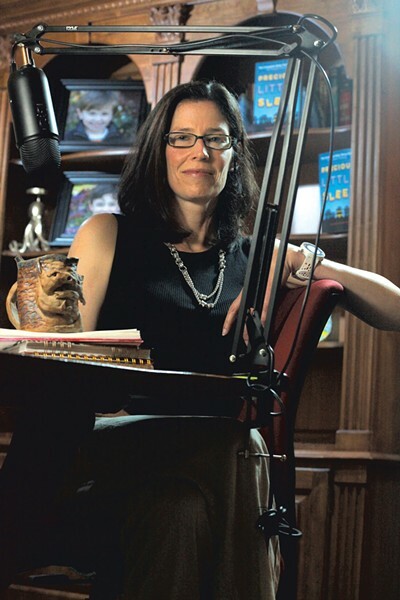 I recently visited Dubief for a chat about her work in her basement home office. Kids VT: Is this office where it all began? ALEXIS DUBIEF: No, no. It all started when my kids were little and they were napping upstairs while I was at the kitchen table on a dinky old laptop. The short story was, we had just moved here and got pregnant immediately. So we had a baby. And we had no network. We didn't know anybody, and had a baby in November: dead of winter. My husband blew out his knee like six months later, so he's having surgeries, on crutches. Duncan is not sleeping; we have every nursing problem under the sun. We have no friends or family. It was a bad time. And I had read all the books, and we took the baby classes. And then the sh*t hit the fan and I was like, Nothing is going right and, all the books, nothing they're telling me is working and he's screaming and not sleeping and everything is a problem. The pediatrician says, "Well, you know, some kids are hard." And I'm thinking, Why is this so hard? Why do I have to have 10 books and be in 14 different forums and groups and websites? This should not be so hard and so confusing. So I'm in the thick of it, and I'm reading and researching about sleep, among other things, and then I started blogging. Not because I was trying to build an empire but because I kind of wanted an outlet. Just to give me a little project to do, so it wasn't all just diapers and baby food. Kids VT: What do you think you're putting out there that wasn't there before? AD: One is: I am, at heart, a researcher. So my first thought was, Here's what these books are telling me, but what do we really know? Because a lot of what we're told as parents is sort of anecdotal, experiential stuff. Like one of the classic examples is: Put cereal in a baby's bottle or feed them cereal before bedtime and they'll sleep better. I mean, this is one of those things that everybody is told. There is no evidence that that's true. In fact, zero. Zero evidence that it makes any difference. And, especially in baby sleep, the world is full of things like that that are just sort of passed down. And so I took the approach: What do we really know? What's really true and what's just like, 100 years people have been saying this and we do it? I think I also have a pretty good sense of humor and most baby stuff is dry and serious. And, frankly, things really blew up for me when I started talking openly about sleep training, which I had a lot of shame about because, I mean, here we are in Vermont — the mecca of all things hippie. And now I'm putting my name on the internet and speaking openly about the fact that, you know, this is an OK thing to do. And [attachment parenting proponent Dr. William] Sears is wrong, and we have options to consider. Kids VT: So, tell me more about how your blog took off, and why you kept it up, even as a busy mom. AD: Well, I think it becomes a positive feedback loop. All of a sudden I was like, Wow, OK. There's like 1,000 people reading my website today. There's 5,000 people reading it a day. Now there's 15,000 people reading it a day. When you're getting all these kind emails from people who are like, "You saved my life, we were dying, we couldn't figure out what to do. Thank you so much!" that feels really good. But we're not wealthy people, and now I'm spending $500 a month just to keep it running. More readers means costs go up, too. So I started offering one-on-one consultations. And then one of my clients had a friend who was a book agent, and so then I'm talking like, Oh my God, a book? Should I write a book? So I spent three months researching the whole process of writing a book. And through that whole research process I decided I didn't really want to pursue traditional publishing, for a variety of reasons. And every time I've asked readers for help, they've been amazing. So I'm like, Wow, I need help. So we do the Kickstarter campaign, and it's amazingly successful, and I am floored and honored and grateful and terrified. So now I'm on the hook. It's no longer a theoretical book. I've been given money by people who are saying, "We have faith in you." So now it has to be done and I'm so terrified that it won't be awesome. So I ended up doing a ton of research like, I'm going to fact-check everything. So it took forever. And now it's only been out two weeks, but so far people say it's really funny and great, which is what I wanted. To be really funny and practical and smart. Kids VT: You are funny! AD: I try very hard to be funny because when you're in the grind, it gets dark. It's just so serious and it's so anxiety-producing and isolating, and I feel like the least we can do is have a little fun with it. In one of the online book reviews, they said, "You'll have to overlook her oddball sense of humor." I was like, [pantomimes stabbing herself in the heart] Gah! I killed myself for three years to be funny! Overlook it?! Kids VT: I like how you're pairing this levity with intense research. Kids VT: Why is it important to you to present all of the research and information rather than just saying: Do this. AD: Most of the baby sleep books say "Do this," and in my opinion that's why they fail. Because there is a wide range of normal for babies, and yet all of these books are so prescriptive. They're like, "Kids should sleep 12 hours a night and kids should sleep three and a half hours a day." And, well, that's going to work for 20 percent of kids, and then the rest of us are trying to shoehorn something unnatural onto our child that isn't who they are. It'd be like saying all adults should wear a size 7 shoe. Right? That would be absurd. I also think there are a range of parenting styles. And my goal was to say, "Listen, you are the parent. You know you and you know your child." So what I do is give you some tools and say, "Use these tools that are best aligned with where you're at, where your child is at and what feels right to you." Also, I want to empower people to be able to diagnose if what they're doing is working. You have to understand how things work so that you can go, Oh, now I see why what we're doing isn't getting the results we hoped for. Now I see why we're getting stuck here, and now I can figure out what I need to do. 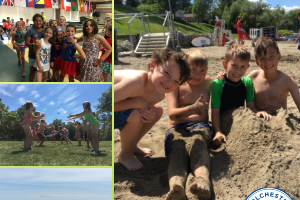 Kids VT: How do you manage self-care when you have so much going on? AD: So the first thing is I don't spend time taking care of the house. I am a terrible housekeeper. You've seen our overgrown yard. I am not a cool house decorator, a cleaner, a make-it-look-nice person. I would love to have, like, a gracious home that's well appointed but it's just not my thing. Whenever we have free time we're never like, "Hey, we should repaint the bathroom." We're always like, "Hey, let's go mountain biking!" So self-care for me: I manage the crazy with exercise. That's how I stay balanced. Running, trail running, mountain biking and CrossFit are my things. The stress builds up and then I sweat it out. AD: I guess I just want to make sure that I'm expressing gratitude, because it wasn't just me in the basement writing a book. It was a collective effort. It wouldn't have happened without Kickstarter. It wouldn't have happened without people on the website offering help and advice. It's only through all of these kindnesses on everybody's part that this book has come to be, and I'm really grateful. 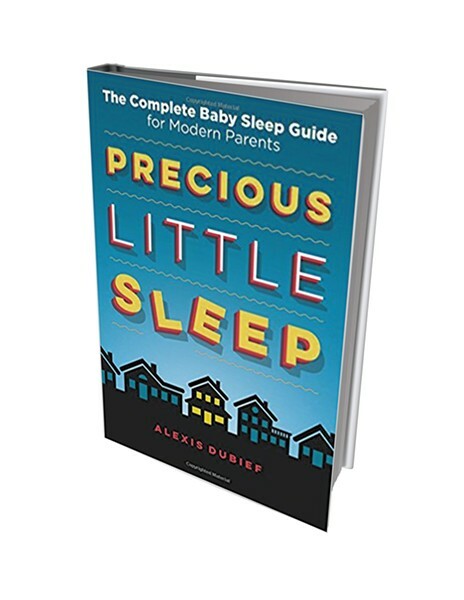 Dubief's new book, Precious Little Sleep: The Complete Baby Sleep Guide for Modern Parents, can be ordered online or requested through your local bookshop. Find more information at preciouslittlesleep.com. During the course of my conversation with Dubief, we discussed my 11-month-old, George. In particular, how he was waking up three to five times every night to nurse. Dubief asked me a few questions to get at the root of the problem (which was that I'd created a sleep association with nursing, so he felt he needed it each time he woke) and gave me some great advice, the gist of which is that I needed to change that association by changing up our bedtime routine and doing some gentle sleeping training through the night. I've followed most of it, and now George is up just once a night. If I could just bring myself to follow the rest of her advice — letting him cry a bit in the night — I'm sure I'd be getting a full night's sleep. Point is, the woman is brilliant.